Rookwood Hospital will be celebrating its 100th anniversary during 2018. To mark this special occasion, Cardiff and Vale University Health Board (UHB) will be hosting a series of events for staff, patients, visitors and the local community. Rookwood Hospital is a rehabilitation hospital in Llandaff, Cardiff. It is one of only twelve spinal rehab units in the UK. It is also a regional neuro-rehabilitation hospital as well as housing a geriatric day hospital, a geriatric intermediate care facility and a geriatric medicine rehabilitation ward. Cardiff’s Parkinson’s Disease services is also based at Rookwood Hospital. The Artificial Limb and Appliance Service, The Electronic Assistive Technology Service, Headway, South Wales Mobility and Driving Assessment Service and Rookwood Sound hospital radio are all based at Rookwood Hospital. Rookwood Hospital plays an integral part in Llandaff community life, with local residents working there, and staff, patients and visitors using the town’s facilities. Rookwood has had an interesting and varied past. Rookwood was built in 1886 by the late Colonel Sir Edward Hill as his home, and subsequently Lady Hill, lived there until 1917. The name ‘Rookwood’ was given to the house by Lady Hill during its construction. Before her marriage she was brought to see the building and was asked to find a suitable name for it. When she came to the property a number of rooks were flying overhead and she immediately thought of ‘Rookwood’, and decided that should be the name. 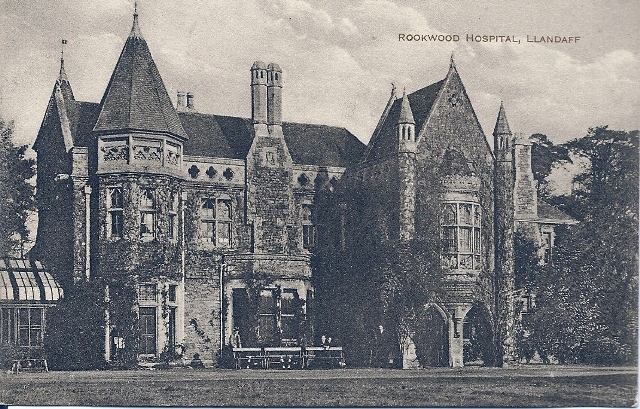 In 1918, Rookwood was taken over for use as a convalescent home. At the end of the First World War it was purchased by Sir Lawrence Phillips and presented to the ministry as a home for Welsh paraplegic pensioner cases. Following this it was continued to be used as a hospital by Cardiff and Vale UHB. In 1932, after building works had taken place to increase capacity, it became a general hospital. During the 1970s and ’80s Rookwood had eight wards caring for people with spinal injuries, brain injury, stroke, multiple sclerosis, and Parkinson’s disease. In 2001 the Spinal unit moved, utilising wards 4 and 5, which then provided 31 beds for spinal injuries and five beds for amputees. To this day, Rookwood is predominantly used as a rehabilitation hospital. Do you have any interesting stories about Rookwood you wish to share? Please email news@wales.nhs.uk or contact 02920 746478. PhotoRenga are inspired by an ancient form of Japanese poetry, in which sequences of haiku construct complex and profound renga poems. The aim of the PhotoRenga project was to produce a series of short, collective, visual renga using photography in a unique workshop format that enabled people of all abilities to take part. The project began when members of the Cardiff & Vale Brain Injury Group produced PhotoRenga in an ongoing workshop programme started in 2010 by David Sinden. David is a Penarth-based independent photographer, arts producer, curator and educator. He survived a brain haemorrhage in 2001 and had a kidney transplant in 2015. Celebration of arts commissioned for centenary of Rookwood Hospital with pictures of the staff from Cardiff Camera Club inspired by the poem; Superheroes of Rookwood Hospital by Regan Paddock . Artist talks about creative writing, print and stitch and other projects inspired by the people who receive and provide care and kindness within a unique building. Opportunity for all to experience an Easter service and for families to get involved in an Easter egg hunt. An opportunity for people who have experience of Rookwood Hospital to tell their stories and contribute to a timeline, deposit and view any artefacts and be inspired by the heritage of the hospital. Fete to celebrate the community of Rookwood Hospital and Llandaff. An event to promote staff wellbeing and say Thank you. 617 Inspirations: Artwork by Armed Forces Veterans. Collection of paintings, ceramics, sculpture and models created by members of 617 Group.